Tim borrowed his dad's backhoe to dig out around the house. 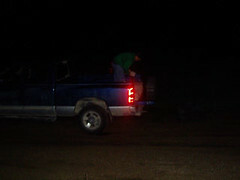 He ended up with two huge piles of dirt. 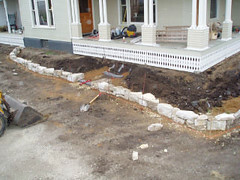 He then used the old limestone blocks to make a retaining wall and filled back in with dirt. Hopefully this will settle over the winter and be ready to plant this spring. We're having some issues with the other block work he's done. I'll post pictures when I get the camera re-charged. It was a stray cat that framed Mr. Hippy. Tim found it later Sunday in the libary. I can't believe we didn't hear it in the night. Tim thinks from the way it acted it was maybe used to living in doors. So back to the landscaping. Here's the photo of the front porch with the brackets up and our two Manards purchases. 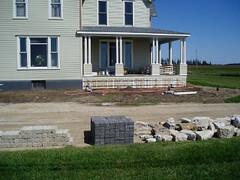 The cream blocks to the right are for edging between the gravel and grass along the house and the black blocks are going to be sidewalk. 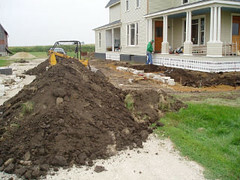 The limestone is left over from the areas where we had to replace foundation. We will be using it to make a retaining wall along the front porch. 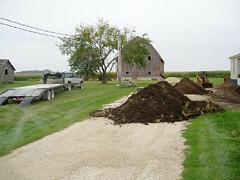 Tim borrowed his dad's skid loader to dig out in front of the house for better drainage. 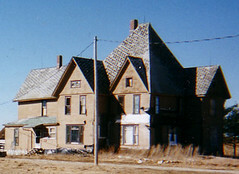 Previously the ground sloped slightly towards the house. Here's Molly and I working hard. Actually we're just trying to stay warm while watching Tim run the skid loader. And here's Tim taking a break. He removed the rickety old wooden stairs so he could dig. 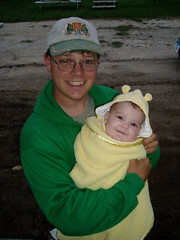 So to get back in the house I had to have him hold Molly while I climbed back up on to the porch. This is one of those things that happen to you that will be a great story at the next get together. Unfortunately the way Tim and I live life and some what due to our friends and relatives (sorry guys) we already have plenty of them. So yes, we will one day look back at this and laugh, but really we have enough to laugh about and I just wish stupid stuff like this would quit happening to us. Last night we got home and our door was barred shut with a long skinny board and a bundgee cord. We get that off and get in the house to find that there's garbage strewn all over the floor and my cookbooks are knocked off the shelf. Again strange, but we are tired, the cats are in place, and like I said before stuff like this happens occasionally. So we decide to head to bed and solve this little mystery in the morning (Molly is spending the night with Grandma Sue). with just a little dab of brown on his back side under the tail. Yes, it looked like one of Molly's favorite stuffed animals needed to start wearing diapers too. In hindsite (he he) I should have taken a photo of this, but when you walk into your living room in your robe Sunday morning and find two piles of crap that's really not the first thing you think of. Or the second or third either. Sorry. Luckily it was pretty easy to deduce that it wasn't Mr. Hippy who perpetrated this because a) he has no digestive system. So Tim goes upstairs to start the washing machine and I'm like how do I get this stuff off. His suggestion is to go out side and shake it off. Which seems reasonable, but let me tell you it's not. It just leads to a general splattering of the stuff that gets all over your lovely fluffy white robe, porch siding, and self. Yes, I probably should have known that wasn't going to work well, but in my defense this was the first time I've run across this problem. So me and my groggy early morning brain did the best we could. So now the question is who framed Mr. Hippy? I'll keep you updated on this compelling mystery. Last week Tim got all of the brackets up under the porches. 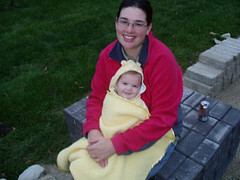 And as I blogged about previously we took a trip to a big box store for a few landscaping stones. 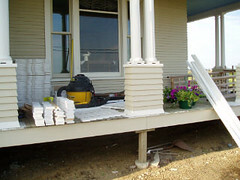 So here is a photo of the front porch the day after our trip. And here's a photo of the underside of the front porch just because it looks so darn cool. 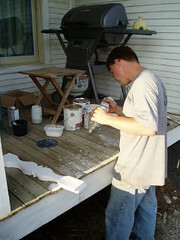 Tim spent what seemed like every free second he had priming or painting those porch brackets. Luckily he had help from my dad who also stopped over to help paint. Yesterday at work I noticed a poster in someones cubicle that showed a picture of a mother duck who walked over a grate and lost her little ducklings. Molly goes in for her four month check up next week. I'm intersted to see where she is height and weight wise. 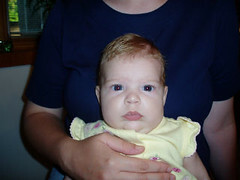 At her two month she was in the 90% for both. She's a big little girl. And it's a good thing or we could loose her in one of the many cracks and crevices around the house. We do still have two gaping holes but we are now able to shut them off behind doors so we don't have to worry about those until she's able to work a doorknob. My what big cheeks you have. Today was Molly's first visit to a big box home improvement store. It was so funny. We strolled in and Tim starts to grab her out of the car seat. I immediately go in for the block because she is sleeping soundly. "I've waited so long to show her this," he says. So we end up taking our daughter to the lighting department which actually does end up being breath-taking to a four month old. She was amazed. It was just comical. The reason for the trip was to purchase some pavers for landscaping. Molly ended up being a perfect angel and sitting so nice in her car seat while her father and I loaded all 350 pieces we bought. So since she's a little young for ice cream we bought her a sun dress for next summer for being such a good little girl. And sorry I forgot the update on yesterdays post. The Milk of Mag kicked in Wednesday night and I ended up getting birthday presents well into Thursday afternoon. And we've had not a problem since. all the way back to July. One of the photos we received from the gentleman that grew up in the house had the front porch as the back ground. 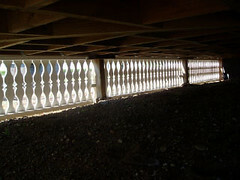 Tim used this photo to make a template for the trim work under the porch (the bracketing to keep animals and such out). He got a load of pine. Drew the template on half of the pieces. Nailed two pieces together and then cut the pattern out using a band saw. I then sanded the rough edges. When Tim was planning this trim work he made the -ahem- less-than-bright decision to use decidely smaller than original boards, so there are more of the fancy cut outs. 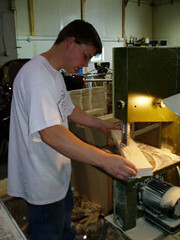 Which ended up making approximately 250 boards we had to cut and sand. And now prime and paint. Wouldn't it have been cool if we could have used the time machine to bring ourselves back in time to help ourselves with all of those boards. Of course that would have caused some sort of something or other in the time-space-continuum causing a collapse of something. Yeah. Something like that.